Elevator Pitch: A mobile engagement transformation? Shankman/Honig partner Peter Shankman, ‘Disrupt’ author Like Williams and High Peak Venture Partners associate Renee Park critique Spoken Layer in front of CEO Will Mayo. SpokenLayer CEO Will Mayo will be appearing on FOX Business Network&apos;s Risk & Reward on Friday Aug. 29, to make the case for his startup that turns written text into audio. In an “elevator pitch,” Mayo will be making the case to host Deirdre Bolton and judges “Disrupt” author Luke Williams, Shankman/Honig partner Peter Shankman and Renee Park from High Peaks Venture Partners. Mayo said that this startup was inspired by his dyslexia. When growing up, his father used to record stories he read aloud in order to help Mayo learn. 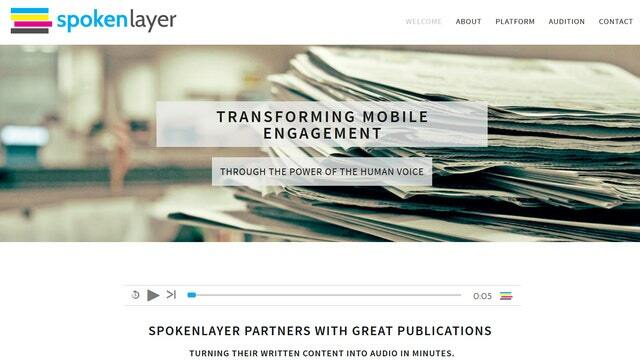 One of the target demographics for SpokenLayer will be commuters, according to Mayo. He hopes that his startup will increase the volume of audio content available. SpokenLayer has raised funding from family and friends, but is hoping to complete a seed financing round in the coming months. They plan to use their financing for hiring and for scaling their business.